How to Find a Reliable Web Design Agency in Sydney? 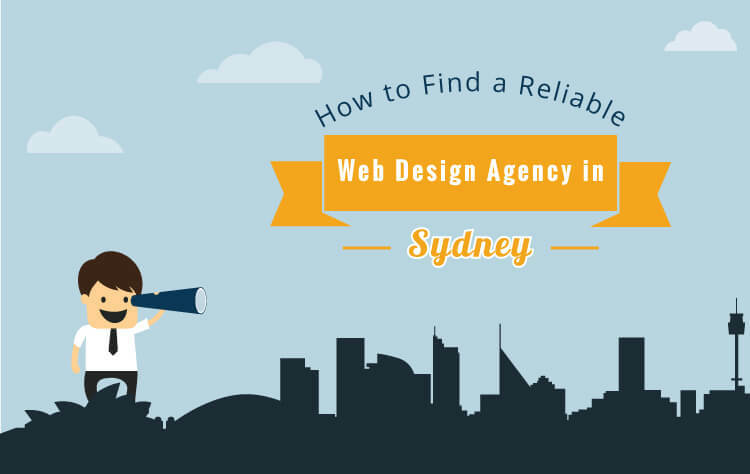 Updated: 08 May 17 By Suzane reliable web design agency 1 Comment on How to Find a Reliable Web Design Agency in Sydney? There has always been an ongoing war between a client and his choice of making a perfect decision. And when it comes to building a website, you ought to make the right choice. …because a strong foundation of good looking website inserts the seed of online revenue. So, you landed on this post. This means you are clearly on a hunt for the best Sydney based website design company. Are you looking for a professional web company which can help you with your business by designing an outstanding and remarkable website? Well, there are tonnes of well-reputed web design agencies in Sydney, which have been delivering thousands of the web and digital experiences. In today’s digital world, business has become more competitive and not having an online presence is totally out of a question. Regardless of what kind of business you have, if you want to be ahead of your competitors, then, first of all, you need to have a well-designed, professional looking website. So, hurry up and find a reliable website design agency, get a suitable user-friendly website and start building your online reputation. But, with the presence of many web design and development agencies in the market, finding the best one for your business has surely become a matter of art and skill. Feeling confused and worried about that skill?? Well, don’t be. Today, we are here to help you by providing tips on that so called “Art and Skill” to choose the best Sydney web design agency which will not only create your dream website but will also help to set your business on the right track with totally different digital level. The professional approach of any web designing firm can be easily demonstrated by viewing their website. Details like the combination of colours used, font styles, logos, a spacing of texts and contrast, titles, banners and the uniqueness of the content incorporated in a website tell us a lot about the company we are interested in. These details might not look crucial but, it does convey a difference in the general value of your website. SEO friendly web design has become a rising trend and an agency should be able to move forward with the ongoing trends in the market. It is one of the most important features of designing nowadays. A website with SEO-friendly design leads to higher level of scalability for search engine crawlers. Web site with a better search engine visibility is all because of SEO friendly designs. While hiring any agency, a budget is definitely a deal maker or deal breaker. A company about to undertake a creative journey should always be well aware of how much the creative services charge. A website is surely a good investment to be made as it can bring you ROI, which can cut all your marketing and advertising costs. Most of the company fails here as they try to cut costs for saving few dollars and ends up with some cheap designs without any tangible results. Why not add few dollars and get a worthy design which helps you get your goal. Now, all you need to do is research and find a right agency that is within your budget. Before jumping into signing contract with any agency, you need to find out the details about that agency. It does not matter how long an agency has been running in business, what you need to know is their working methodology, their problem-solving ability and how well they know you. So, try to dig out whether they have been able to deliver right solutions to their other clients or not. In this competitive world of digital marketing, nothing works without a proper strategy. If you want to stand out in the crowd, then you surely need to come with a strong digital strategy which can help you to beat your competitors and move ahead. A good digital agency should be able to know you and offer you with a proper digital strategy which will not only give your business a strong sense of trust and authority but will also help you reach your goals by staying within your given budget. When we browse websites on the web, we find most of the websites of a similar pattern. There’s nothing different about them. Having a website with a right design which conveys your company’s features in right way always work. The work does not simply end after building and launching a website. You also need to take care of its security and maintenance issues which may arise in future. There are tonnes of digital agencies in Sydney, which maintains a good relationship with their clients even after their project ends and have a good maintenance plan to consider. So, you need to find out whether your agency has plans to deal with future issues. It is always better to be sure whether you are investing on right thing with a right place. The similarities between building a house and building a website are huge. If you do the right job from the start, then you need not have to worry for years. But, if you be careless and don’t care about the quality then, you surely need to get ready for long and laborious years ahead. Quality counts a lot in this matter. So, if you are thinking to hire a web design agency to build your website then, don’t go only after pretty web designs. Make sure to look after an agency with a great team who has all the necessary skills to accept your targeted goals and take it through full process to build a successful website. I can be honest to say that Nirmal Web Studio is the right choice to rely on. It is renowned for delivering dynamic, strong, vibrant and user-friendly websites which suit clients’ budget perfectly. Our creative team is the best team for building websites. It is always fun and honour to work with them. If you are looking for beautiful web design in Sydney, Nirmal web Studio is here for help.